It was a tragedy waiting to happen – a least that’s what the West Bengal state government’s own engineering and consultancy agency RiTES had warned the state in 2016 when it evaluated the condition of various bridges in Kolkata after the collapse of the Vikekananda overpass, killing 26 people. The consultancy, which worked under the WB Public Works Department assessed the Majerhat structure and several other bridges as precarious but no action was taken according to officials. The near fifty-year old structure was maintained simply by re-tarring and repaving the road creating layers of surface on top of the original one. In the West, annual inspection and five-year deck testing normally reveals when a bridge requires a major rehabilitation. Engineers are then contracted to work not only on the surface but also on the supporting columns. The road is dug up and the old cement and tar is removed and replaced by a new surface so minimal weight is added to the bridge. When necessary additional reinforcement of supports is done, thereby minimizing the risk of structural failure. Three people are now dead as a result of the negligence and some twenty are injured. In the case of Majerhat (and presumably other bridges in the state and maybe the nation) the addition of weight by resurfacing makes increases the risk of structural failure with each iteration of such ‘maintenance’. What’s even more troubling is that older overpasses like the one in South Kolkata are more structurally sound than newly constructed bridges as the collapse of the Vivekananda Flyover proved. In that case, according to an Indian Institute of Technology report, faulty design, incompetence and an inability to properly mix cement, and overall improper project execution caused the failure. The Vivekananda Park Flyover project was commissioned under the Jawaharlal Nehru National Renewal Commission with tender going out in 2008. In 2009, the Hyderabad based infrastructure development firm, IVRCL won the tender despite being under the scanner of the Railways Ministry and investigated by the CBI for supplying poor materials to build houses for Tsunami victims. Mamata Banerjee was the Central Govt. (coalition) Railways Minister at the time. Indeed, in this capacity, Banerjee awarded the contract for the Rs 761-crore Udhampur-Srinagar-Baramula Railway Tunnel to IVRCL despite the firm undergoing a CBI inquiry. And, another flyover contract for North Kolkata that went to IVRCL from the Kolkata Metropolitan Development Authority was ultimately cancelled after only 10% of the work was completed some five years after commissioning. According to a report by BJP National Secretary, Siddharth Nath Singh, a subcontract for the flyover was given to a relative of Trinamool MLA and candidate from Jorasanko constituency Smita Bakshi. Bakshi is the proprietor of Sandhyamani Projects. The sub-contractor was allegedly involved in supplying cement and iron for the portion of the Vivekananda flyover that collapsed. IVRCL is no stranger to bribes and kickbacks; all the more reason it was being investigated by the CBI. According to Singh, Banerjee who was the railway minister in 2009 and 2011, awarded a joint venture of IVRCL a contract to build the Rs 761-crore Udhampur-Srinagar-Baramula tunnel despite the company being already blacklisted. The contract was cancelled on April 11, 2014 after 10% of the work was completed. “Mamata Banerjee knew that the CBI was investigating a case against IVRCL for supply of materials to build houses for tsunami victims. She cannot run away from the fact that IVRCL got this contract when she was the railway minister. She cannot say she did not know IVRCL,” Singh said. Both Singh and Congress leader, Rahul Gandhi also attacked Banerjee on the issue of corruption and highlighted the Narada sting operation, which purportedly showed Trinamool leaders including state urban development minister Firhad Hakim taking bundles of bribe money. Corruption cannot definitely be ruled out: In the two years that have passed since the bridge collapse, scant little has happened: The two government officials who were arrested still have no chargesheet filed against them. According to the media, 10 officials of Hyderabad-based private company IVRCL were chargesheeted. Four others, hired by IVRCL from other companies, were booked but not chargesheeted. All those apprehended have been out on bail for sometime, walking free. Surely these people know where the bodies are buried, and so the police, who are under the direct charge of the Chief Minister will never complete this investigation as the powers that be have a vested interest in assuring that the truth never sees the light of day. The report that a supplier close to the government supplied poor quality materials has had no consequences on that company or the MLAs connected to it. The syndicates continue their chicanery unabated. And, the MLA from the concerned constituency won re-election, hence. The government has not yet acted on any of the recommendations to demolish the flyover. In the case of Majerhat bridge, it was recently highlighted that the bridge’s safety had been a concern for a while. The Telegraph reported that a safety audit had been done after the 2016 flyover collapse. It had warned that it was carrying more load than it could bear. The PWD even knew the reason. The surface had been re-laid year after year, making it heavier and heavier to the point at which the surface between the beams could bear no further load, and the road cracked open. In this instance, it seems that apathy and bureaucratic paralysis were responsible for the government not acting on the conclusions of safety auditors neither for the Majerhat bridge nor the array of other bridges identified as at risk. And, the problem is not isolated to Kolkata. In July, a bridge collapsed in Mumbai due to heavy rains. And, earlier this year two bridges and a four-storey building collapsed in Bangalore, India’s celebrated tech capital. VARANASI, 2018: At least 18 people were killed when an under-construction flyover collapsed in Varanasi earlier this year. LUDHIANA, 2018: Gill flyover (Gill chowk) in Ludhiana collapsed last week possibly due to rats. Municipal officer Dharam Singh said, “there was a dump below the flyover due to which rats inhabited the spot. It was the rats who damaged the flyover”. No casualty was reported. NEW-DELHI, 2015: A portion of the Wazirabad- Janakpuri elevated corridor collapsed on to a busy road in outer Delhi’s Pitampura area, damaging three parked cars and injuring two people seriously. According to the reports, preliminary investigations suggested that the straps holding the block snapped causing the corridor to fall. 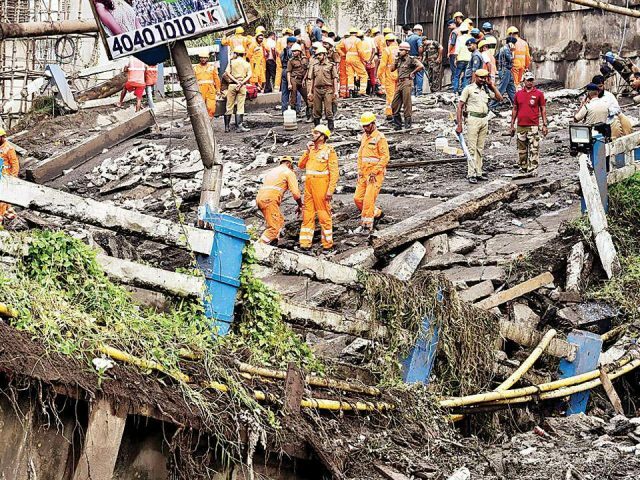 SURAT, 2014: Three labourers were killed and six others injured when a portion of an under-construction flyover collapsed in Parle point area of the city, Surat Municipal Corporation (SMC) Commissioner MK Das told PTI. The mishap occurred when the labourers were shifting the columns of the bridge during which a portion of the flyover fell on them, he said. The collapsed flyover was a part of the city`s cable-wire bridge connecting Parle point area to Adajan near Tapi river, Das said. The SMC has formed a committee to inquire into the collapse and an FIR has been ordered. UTTARAKHAND, 2012: Six labourers died and 36 others were injured when an under-construction bridge collapsed at Chauraas in Pauri Garhwal, Uttarakhand. This is a man-made tragedy, and one that seems poised to be repeated in other structures, which have been ill-maintained and downright neglected. 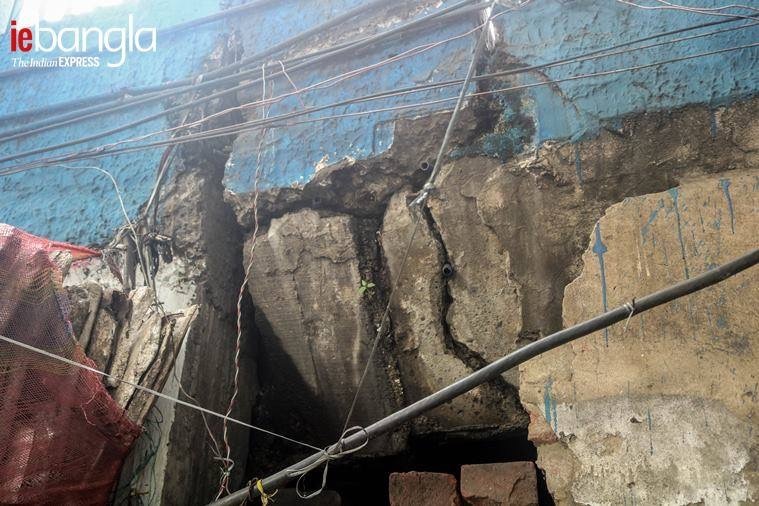 The Sealdah flyover, for instance bears a huge crack that is being held together by bricks. How long will that band aid solution last. All of this comes as Puja season is revving up, the state once again pouring money into the clubs who run the Pujas. With corporate sponsorship of these spectacles, hundreds of crores of rupees will be spent on pandals. If the clubs donated only 10% of their revenues to help repair the bridges, many lives could be saved. After all, isn’t this a better use for the money than adding more lights or making that faux Eiffel Tower pandal higher or using fewer precious stones in the decorative sari for the murthi? If not, then one can reasonably conclude that while life is cheap in 21st Century Kolkata, Puja celebrations are certainly not. Perhaps the solution is to build pandals under the flyovers. Perhaps this will finally put an end to bridge collapses!